To set up Notifications click on Config → Finance → Notifications. There are two main types of Notifications which can be configured here: Notifications of created Invoice, Proforma Invoice or Payment and Prepaid Notifications. When Invoice, Profoma Invoice or Payment will be created customer will receive a notification by email with its attachment. Automatically send notification after creating - enable/ disable the option of sending notifications automatically after creating the Invoice. Subject - write the subject of notification message. Template - choose the template for notification message. Delay in sending - choose in how many hours notification will be sent after Invoice creation. The options are: in 1, 3, 6, 12, 24, 48, 72 hours. Working days - select days of week when Notification will be sent. It will be sent after selected delay in hours on the first working day and hour. Working time - select working hours for the notification sending. Notification will be sent after selected delay in hours on the first working day. 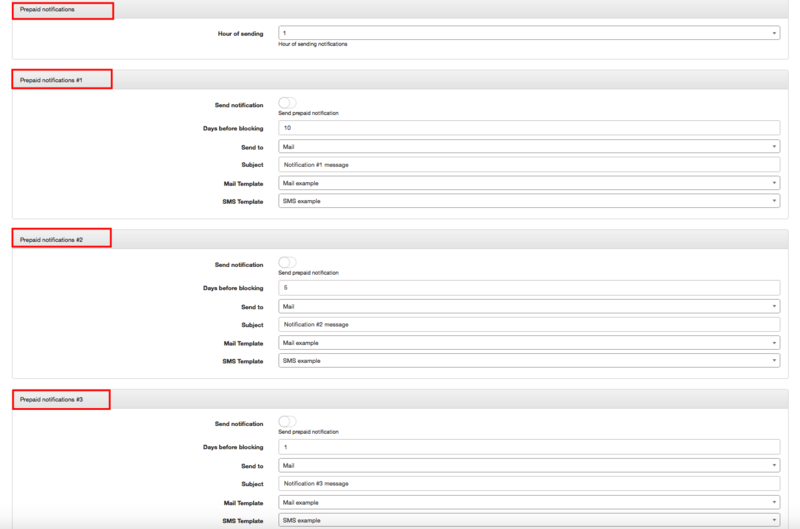 Automatically send notification after creating - enable/ disable the option of sending notifications automatically after creating the Proforma Invoice. Delay in sending - choose in how many hours notification will be sent after creation of Proforma Invoice. The options are: in 1, 3, 6, 12, 24, 48, 72 hours. Automatically send notification after creating - enable/ disable the option of sending notifications automatically after creating the Payment. Delay in sending - choose in how many hours notification will be sent after the Payment creation. The options are: in 1, 3, 6, 12, 24, 48, 72 hours. Attach receipt - you can enable or disable option to attach receipt. Prepaid Notifications are the same as Payment Reminders. The only difference is that Prepaid Notifications are used in Prepaid Billing and Payment Reminders in Recurring billing. Prepaid Notification is an email, SMS or email+SMS prompt sent to customers to notify them about their low balance and remind them to make a payment. Hour of sending - choose the hour when Prepaid notification will be sent. Send to - select the sending option of prepaid notification: Mail, SMS or Mail+SMS. 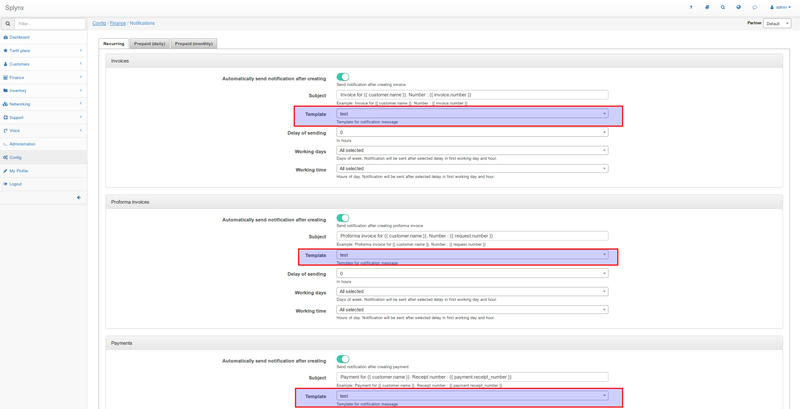 Information about configuring SMS can be found in our tutorial page - SMS config. Mail Template - choose template for the mail notification. SMS Template - choose template for the SMS notification. If customer has Prepaid type of billing he will also be notified about his current balance in Customer Portal → Services. Now all customers except customers whos billing type - is not prepaid, after creating invoice, Proforma invoices and Payments will get a notification with text: "example customers login"